It was awesome of the owner to only charge half price of the service call due to the impossibility to repair a 30 year old double oven. Very fair of him to do that for us. It was great that they were able to come out the very next day too. Nate immediately knew what was wrong and fixed the problem within 10 minutes. 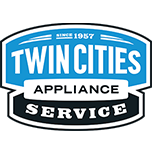 Since I only use Twin City Appliance for service, I can't compare cost of service. Timely initial response. Jim was knowledgeable. Issue was lack of parts availability for new unit. Unit was installed 1/2/19 and is still down. Replacement unit won’t arrive until 1/17/19 earliest. Jim is very pleasant and knows what he is doing! Tech came out to our house. Didn't order the part yet that was covered under warrenty becasue they had to be sure it was that part. Charged us $99 to tell us it was that part and then wanted another $100 + shipping fees to get the part replaced. Was told by Maytag would have the part replaced for a total of $99.75. Paid the man just to leave. Im sorry that you were misled by the Maytag customer service rep- Our service call is 97.95 which includes a full diagnosis of what is wrong. From there the technician would explain if any parts or labor would be needed at any additional costs. We took the tub out of your washer to inspect and at that point a decision on which way to go was made to stop repairs. You were not charged anything more than our trip and diagnosis charge. I really liked the technician tracking system--very slick! DOUBLE OVEN WHIRLPOOL WOD97EC0HZ01 "Ms pic.Customer locked the control Nd now it will not unlock. They have had other touch issues with the control panel so they were testing the buttons to see what worked when it locked up.Turned the breaker off for 2 minutes and tested it. The control.panel works great and the oven heated to 350.Technician lives nearby and had a power surge/spike at his home and had to reboot his oven too. advised them to turn the breaker off for2 minutes and test the control panel and oven when this happens again, if it does." RANGE WHIRLPOOL WFE975H0HV0 Pulled out unit and took off top sides and back. Removed insulation on bottom and side. When pulling lower insulation out mouse jumped out of it. Cleaned out all debris possible and reassembled. Customer is going to monitor the scent and exterminator is coming today. WASHER WHIRLPOOL WTW4855HW1 "Found an error code for long fill. Cleared error code. Found cold water supply valve in the off position. Turned cold supply valve to on. Ran an auto test. All tested ok. Advised customer on cycle selection, detergent use, load size and type"
WASHER WHIRLPOOL MVWB765FC2 "Lid lock works correctly, plug in unit displays 888 and lid locks as if stuck in diagnostic left unit unplugged lid is unlocked ordering control and UI if needed. Control on back order till 4/1; ordrng 1 W11135393 (FASCIA) and 1 W11135393 (CONTROL )"
WASHER MAYTAG MVWB765FW0 "Found error codes for 3-1 and 7-9. Pressure switch error and locked rotor. Cleared error codes. Notice drain hose was to far down stand pipe. From what the customer explained was happening, most likely unit was siphoning. Pulled drain hose up to an acceptable height and secured with a zip tie. Ran an auto test and a normal cycle. In the normal cycle, unit stopped filling and agitated. All tested ok. Advised customer on cycle selection, detergent use, load size and type"
REFRIGERATOR WHIRLPOOL WRFA35SWHN00 Traced noise back to warning label on power cord hitting back of refrigerator. DISHWASHER WHIRLPOOL KDFE204ESS1 "Pump was seized. Removed the pump and found some glass in the pump. Unit now drain, noticed the majority of the holes in the upper and lower spray arms are plugged. Customer going to order new spray arms and install themselves. Other than the lack of spray all checks ok on the unit." WASHER MAYTAG MTW5570TQ0 "Found oil leaking from gearcase and motor failure. Unit needs gearcase, clutch, coupler and motor. There is rust on the base and cabinet needs repair. Cabinet is separated. Office to schedule install and allow 2 hours for install, as the dryer needs to be moved so the washer can be worked on. If approved by AIG; ordrng 1 285785 (clutch) and 1 285852A (coupling,motor) and 1 3360629 (gear case) and 1 WP661600 (MOTOR )"
OVEN WHIRLPOOL WGG745S0FS02 Installed new burner cover for the upper oven. Heated the oven to 350 degrees and no abnormal noises and cover didn’t pop at all. All checks ok.
REFRIGERATOR KITCHEN-AID KRFC704FPS01 "Water not going into ice maker, likely fill tube problem, water may be spinning as it comes out of fill tube, ordering fill tube and ice maker to replace. Parts ship to customer, return 3/21 to install. ; ordrng 1 W10917894 (FILL TUBE ) and 1 W11115534 (icemaker)"
REFRIGERATOR WHIRLPOOL WRF540CWHZ01 Replaced the dispenser switch and cover. The dispenser now shoots out water no matter where the gray button is pushed in. WASHER MAYTAG MVWB765FW3 "Found error codes 0-4 spin limited by water temp, 3-2 inlet water temp fault, 7-9 locked rotor. Ran an auto test. Basket and agitator are moving together on agitation, and loud noise. Ordered a new fill valve and gearcase. Gearcase ETA is 3/21/19. Office to Xpart and schedule install with customer. Customer to have dryer removed from room so washer can be worked on. There is a water softener in front of the unit and would not be able to tip back and forth ; ordrng 1 W11134159 (GEARCASE) and 1 W11165546 (FILL VALVE)"
MICROWAVE WHIRLPOOL WMH32519HV3 "Arched LR rack holder customer states there was product on rack when arcing occurred possible rack not centered correctly in supports ensured her unit safe to operate, customer declined to up repair due to cosmetic look will follow up wi WP." WASHER MAYTAG MVWC565FW1 Have 120 volts and correct polarity. No response from control. No green light illuminated. Ordered a new main control ; schdld next appmnt for 3/2 SAT !